Summary HomePlug AV2 MIMO Adapter set with 3 port Gigabit switch and pass through outlet based on QCA7500 chipset. Powerline adapters can extend your Ethernet network via power wiring instead of running Category 5E / 6 cable. While you won't get the performance of Ethernet, the new breed of HomePlug AV2 MIMO adapters can provide ~ 450 Mbps of total throughput with multiple traffic sources. Powerline also tends to be more stable and have lower latency than many wireless connections. The TL-PA8030P is the only AV2-MIMO product with multiple (gigabit) Ethernet ports, three to be specific. This would allow connecting a Smart TV, gaming console and perhaps a wireless access point without an outboard switch. The TL-PA8030P also has a filtered 16 A passthrough power outlet, but that's not a unique feature. Measuring 5.2×2.8×1.7 in. (131×72×42 mm), the adapter is bigger than other AV2-MIMO products we've tested. The composite image below shows the TL-PA8030P plugged into a standard U.S. duplex and that it blocks the upper power socket from being used with a grounded plug. NETGEAR's PLP1200 doesn't have this problem, nor does TRENDnet's TPL-421E. The image below shows adapter callouts. Note the cooling vents on both sides of the unit as well as on the bottom. And here is an image that describes the LED indications. The User Guide says the adapter goes into power-saving mode after 5 minutes of Ethernet inactivity and powers up again when activity resumes. This was tested via the following procedure, which ran without a hitch. Note the description above of the power light blinking during power save is incorrect. Instead, all adapter lights shut off during power save. Plugged in two adapters, let them link up and started a long ping from the HomePlug connected machine to another machine on my Ethernet LAN. Unplugged the cable connecting one adapter to my LAN switch. Verified that ping showed no response. Waited until the Ethernet-unplugged adapter entered power-save. Plugged Ethernet back in and verified the adapter powered up and ping returns resumed within a few seconds. As noted in the introduction, the TP-LINK TL-PA8030P is based on the Qualcomm QCA7500 HomePlug AV2 MIMO IC. We've reviewed three other AV2-MIMO products so far, the ZyXEL PLA5405Kit, TRENDnet TPL-3202E2K and NETGEAR PL1200 Powerline 1200. The fifth AV2-MIMO product, the D-Link DHP-701AV PowerLine AV2 2000, is based on Broadcom's BCM60500 chipset. The photo below shows the TL-PA8030P removed from its case. While the other Qualcomm-based powerline adapters use an AR8035 Gigabit Ethernet chip, the TP-LINK uses a QCA8337 Gigabit switch to support the three Gigabit Ethernet ports. Powerline adapters are designed to be easy to install, and the TP-LINK product is no different. You can just plug them in and they will use a default network name (HomePlugAV) with 128 bit AES encryption. If you press the Pair button as described in the callout diagram, the network key is changed from the default to a unique value. This prevents other adapters from connecting to your network. While you don't really need a utility to manage or setup the basic features, TP-LINK provides a simple utility you can download. The short gallery below shows you a few screenshots of the utility, which lets you check status, view adapter link rate, set QoS priority and VLAN tags and upgrade firmware. We tested the TP-LINK TL-PA8030P using our standard powerline test procedure with all results entered into the Powerline Performance Charts. For this comparison, I chose the top four ranked AV2-MIMO products, which included the NETGEAR PL1200 Powerline 1200, TRENDnet TPL-3202E2K and Broadcom-based D-Link DHP-701AV PowerLine AV2 2000. The Downlink Throughput plot below shows that the TP-Link had the highest throughput at all three tested locations. The composite iXChariot downlink plot shows steady throughput at all locations with lower throughput at more distant locations. Uplink throughput, however, is a different story. The plot below shows that the D-Link HDP-701AV had a clear advantage for locations A and C. In location E, the TP-LINK just narrowly edged out the D-Link. The uplink IxChariot plot shows a high throughput variation for Location A that caused its significantly lower average. Throughput in Locations C and E is more consistent, but still lower than downlink. The TL-PA8030P's simultaneous up/downlink IxChariot plot shows very lopsided results with the downlink stream having achieving three times the average throughput as uplink. The downlink plot also showed significantly more variation than the uplink plot. Adding another simultaneous stream pair gained almost 40 Mbps for a total throughput of 446 Mbps. In this test run, average uplink had about a 20% advantage over downlink - in part due to the imbalance between pair 1 downlink and pair 4 uplink. Noise tests were run in Location E. In the plot below, the top, blue line shows the baseline throughput test with no noise introduced. The middle green line shows throughput when noise is introduced throughout the entire test. When the noise is removed at 30 seconds into the run, the red plot shows that throughput gradually climbs to the levels in the original "no noise" plot. However, the red and green plots run concurrently at the same throughput levels from about 10 seconds up until 30 seconds when the noise is removed. This indicates that the the adapter hasn't adapted to the noise, but only adapts to the absence of noise. Comparing the Ranker Performance summary for the two products shows both had equal numbers of #1 and #2 sub-ranks, which accounts for the tie. Performance is the only thing the two products tie in, however. Remember both adapters in the TL-PA8030P KIT have three-port Gigabit switches and 16A filtered pass-through AC outlets, a combination no other product currently offers. Currently, the TL-PA8030P KIT is available only in-store at select Frys and Microcenters. TP-LINK tells us it will become "more generally available" in September. As of this writing, it is not on Amazon, and NewEgg is showing it only from a third-party vendor at $146.24 (+ $34.99 shipping). While the TL-PA8030P Kit is unique by virtue of its three Gigabit Ethernet ports, that's a tremendous premium to pay. However, you can order it now from Frys for $99.99 - about 20 bucks more than the top-ranked NETGEAR PL1200. But note it won't ship until after September 7. If you don't need three Gigabit Ethernet ports, the PL1200, currently at $80, still offers the best bang for the buck. 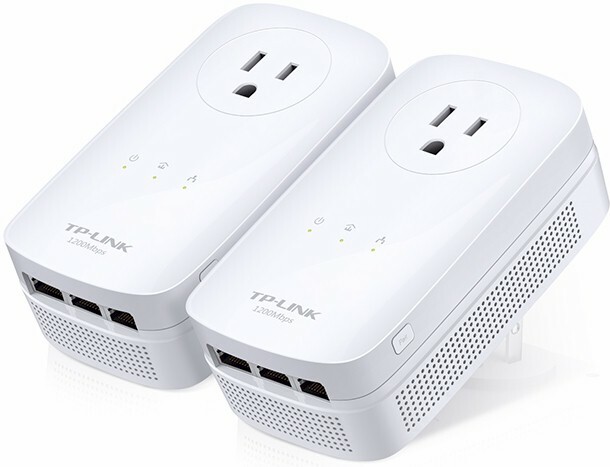 Though not tested, TP-LINK's TL-PA8010P KIT, a single Gigabit Ethernet port version of the TL-PA8030P KIT with passthrough power outlet, is very competitively priced on Amazon also around $80 and available for immediate Prime shipment. You can also go with NETGEAR's PLP1200 passthrough outlet version, which Amazon is also currently showing at $80, the same as the sans-outlet version. No matter which way you go, you'll be getting the best powerline adapter you can buy right now, for relatively little money.